There's no sugarcoating it: The Bitcoin price has plunged nearly 29% over the past two months. The CoinDesk Bitcoin Price Index, which averages the Bitcoin prices across several major Bitcoin exchanges, dropped from $647.34 on July 2 to as low as $460.67 on Aug. 18. 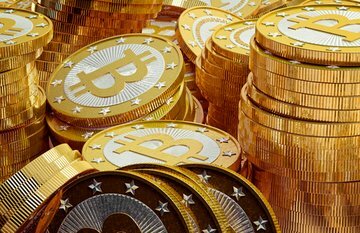 The Bitcoin price did manage to climb over $500 shortly afterward, but lately has slumped back into the $470s. While few in the Bitcoin community are panicking over this decline, many are puzzled. Despite the lack of any unusually bad news, the price keeps trending down. It's actually not as perplexing as it appears. At this point in Bitcoin's evolution, the market forces pulling the Bitcoin price down are stronger than those pushing it up. A recent analysis by Citigroup Inc. (NYSE: C) identified what's been going on, pointing to Bitcoin miners and merchants as the main cause for the slump. We know the Bitcoin miners have been in an "arms race" for a long time. Better equipment means more bitcoins and more profits, so many miners have been investing heavily in costly mining rigs. These rigs also consume an enormous amount of electricity, adding to the miners' costs. That means the miners need to sell many of their newly created bitcoins to pay their electric bills as well as pay off debt incurred with the purchase of the rigs. "Last year miners were selling a much lower percentage of new Bitcoin mined. Nowadays it's estimated that they're selling 70% to 90% of their Bitcoin," Mark Lamb, chief executive at Coinfloor, a London-based Bitcoin exchange, told CoinDesk. With Bitcoin mining as popular as ever, that translates to a rising tide of new bitcoins getting sold on the exchanges. "If the miners are a steady source of supply and there is no increase in final demand, we have this overhang of Bitcoin being sold in the market. In consequence, we have downward price pressures," the Citi report concluded. And then there's the impact of the merchants, which many had assumed would be a positive for Bitcoin prices.